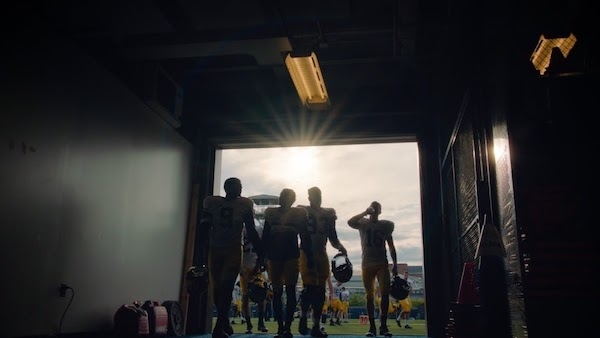 Amazon Prime Video takes viewers behind-the-scenes of “the winningest program in college football” in All or Nothing: The Michigan Wolverines, documenting the team’s 2017 season. The series provides an intimate look at the lives of head coach Jim Harbaugh and his young team of student athletes. All eight episodes of the series premiered on Amazon Prime Video on April 6th. Leading post studio Nice Shoes, led by senior colorist Lenny Mastrandrea and executive producer Tara Holmes, collaborated with Amazon and The Montag Group to color grade and deliver the series with a stunning, rich HDR (High Dynamic Range) look. As Prime Video has been one of the early providers of HDR content, offering almost all of their original series in HDR, the series needed to be graded in both HDR, and SDR (Standard Dynamic Range). With the two delivery formats, Nice Shoes developed a workflow in conjunction with Color Front, so that the project would be completed without having to grade it twice. From the very start of the project, Mastrandrea found himself in a unique scenario, as the executive producer Jim Jorden has overseen the color grading process on many projects and post supervisor Christopher Rohlfs is an experienced colorist as well, having worked extensively with both the NFL and Nascar.